I treasure my volumes of Sherlock Holmes mysteries by Sir Arthur Conan Doyle, don't you? Needless to say, I was thrilled when I received a copy of My Dear Watson by L.A. Fields for review. This story, however, is not focused on details about the mysteries. Instead, my dear friends, Fields queers the relationship between Holmes and Watson as it evolved throughout the years they worked together as detecting partners. Fields approaches the queering of these favorite characters from a different and creative angle by utilizing the second Mrs. Watson as narrator. Mrs. Watson's somewhat acerbic narrative voice rivals that of Holmes himself, as do her well-honed powers of observation and deduction -- particularly when it comes to the relationship that existed and still exists between her dear, sweet Dr. Watson and the odious Mr. Holmes. It is most telling that as she begins her narrative, Mrs. Watson casually mentions her acceptance of her husband's flexible sexuality and relationship with the well-known detective, yet when referring to Sherlock Holmes in her journal, she uses the three dreaded capital H's: He, Him and Holmes. What does that tell you? I can smell a hint of salt from here, so my dear Watson must be overwhelmed with the scent, since he has his face buried in Holmes's shoulder. They are embracing each other tightly, blissfully, as if they've been a lifetime away from one another. I don't believe I am jealous --- I'm a modern woman, and I knew of my husband's flexible nature before I married him --- but I am rather destabilized by this scene. They just look so desperately happy to be holding one another. It's touching, but it touches one awfully hard. You see, although Mrs. Watson doesn't openly oppose Watson's relationship with Holmes and says she understands her husband's obsession with the great detective, she believes in her heart that this only came to pass because of Holmes' manipulative nature. Mrs. Watson narrates Holmes' courtship and seduction of an initially unaware, naive Watson who then becomes enthralled and devoted to Him throughout the years. The relationship between the two men fluctuates between happy and deep dark times until their time together at 221B Baker Street ends. The first separation takes place when deeply hurt and disappointed in Holmes, Watson marries his first wife Mary only to be seduced away from her within a short period of time. Mrs. Watson shows sympathy for Mary but understands her sweet Watson, after all "He is rather infectious, Sherlock Holmes. A dark and glamorous thing. " The story is divided into sections. In the present time Mrs. Watson and her household receive Holmes during his first visit to Watson's home. In other more abundant sections, Fields employs a rather interesting flashback format by having Mrs. Watson narrate the complete history of the men's relationship as it unfolds while they solve mysteries, until the timelines merge in the present. This presentation works rather splendidly as Fields concentrates mainly on the history of the relationship with spare entries dedicated to the present. And speaking of spare, each chapter/mystery case revealing the building intimate relationship between Holmes and Watson is also short in length. Usually short chapters make for a quick read, however that was not the case in this instance. The relationship as it unfolds between Holmes and Watson and Fields' approach to this story is quite creative. However, while Mrs. Watson's narrative gives the reader an immediate sense of her perceptions and inner emotions, there are sections where it simultaneously creates a certain distance between the reader and the other main characters -- a disconnect -- that slows down the pace. Fields' characterization of Holmes is notable in that it reveals the man behind the legend by overtly magnifying his weaknesses while subtly depicting strengths. Watson's characterization is not as well defined as that of Holmes, but the portrayal is just as subtle. Fields portrays Watson as an extremely sympathetic character, but look under the surface and you'll find that this depiction is deceiving. On the other hand, our narrator Mrs. Watson becomes as fascinating a character as Mr. Holmes. A contradiction, she's a woman to be reckoned with -- astute and intuitive, possessive and giving, protective, strong and vulnerable -- and I do believe that in the end Mrs. Watson has the last word! 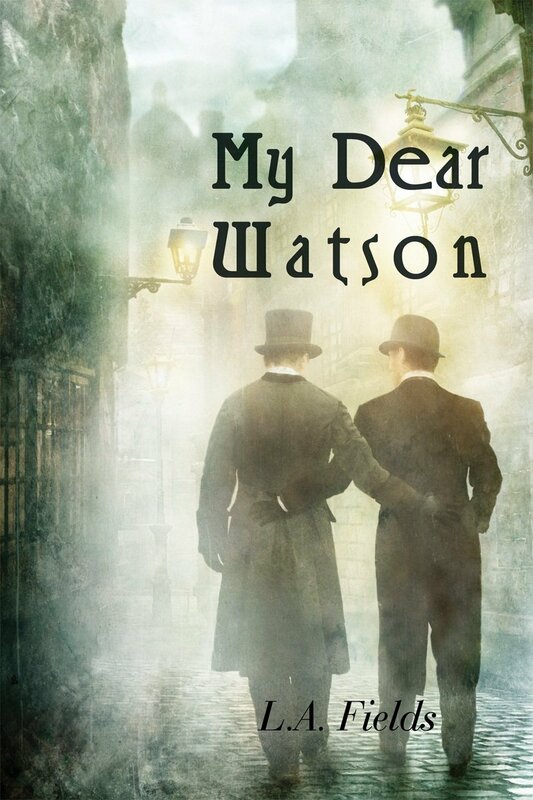 To summarize, I enjoyed My Dear Watson, particularly L.A. Fields' subtle execution and creative approach to building of a complex queer romantic relationship riddled with conflict, jealousy, resentment, love, tenderness, and understanding -- one that involves two of my favorite fictional characters of all time. A solid read.